Low Carb Indian Juices, Low carb Indian drinks, smoothie recipes. Fruits are one of the healthiest ways to top up on fibre, not to forget vitamins and minerals too. When you do not have time to munch on whole fruits or want a change, go for one of these tasty juices, which are satiating and very pleasing to the palate. We have used different combinations of fruits and veggies to come up with mouth-watering juices. Having low carb drinks is a healthy way to drink. We have choosen Indian juices and Indian drinks, smoothies between 5 to 15 grams of carbs per serving below. yes, we have some low carb Indian juices. There is no sugar or honey added which results in higher carbs. Let's start with the carrot tomato and beetroot juice recipe which is a rich Vitamin C juice with only 6.5 grams of carb. Brain booster in one drink you must try when concentration levels are dipping. Also great for kids doing exam. Called Brain Booster, Carrot Apple Beetroot and Spinach juice recipe where beetroots, carrots and spinach contain iron, folic acid and zinc, all of which improve the oxygen-carrying power of blood and thereby increase brainpower, concentration and memory. Another favourite of mine is Carrot and Red Pepper Juice which is a vegetable juice great for your eyes and has some tomatoes in it too. Indians love their badam and nothing like the homemade almond milk recipe which is made of almonds and water. No sweetener added and its just 3.1 grams of carb. If you wish to soak your almonds and then make the milk, follow homemade almond milk with soaked almonds recipe. Indians love their saffron and saffron cardamom almond milk which is sweetened with dates, vegan and only 3.8 grams of carbs. Chaas is loved in all parts of India. Try the punjabi mint chaas which is just 2 grams of carb. Can't beat that. There is the classic salted chaas recipe with 5 grams of carbs. Indian low carb smoothie for diabetics is jamun smoothie recipe with 5 grams of carbs though it does use a sugar substitute. Here is a nice healthy low carb smoothie perfect for a healthy breakfast or mini meal. The avocado spinach vegan smoothie recipe has only 6 grams of carb where avocado helps to thicken the smoothie and give it a creamy texture. Add pear to this and you get avocado spinach pear smoothie recipe with 13 grams of carbs. If you love eggs, try the carrot tomato and egg smoothie recipe which is just 7 grams of carbs. 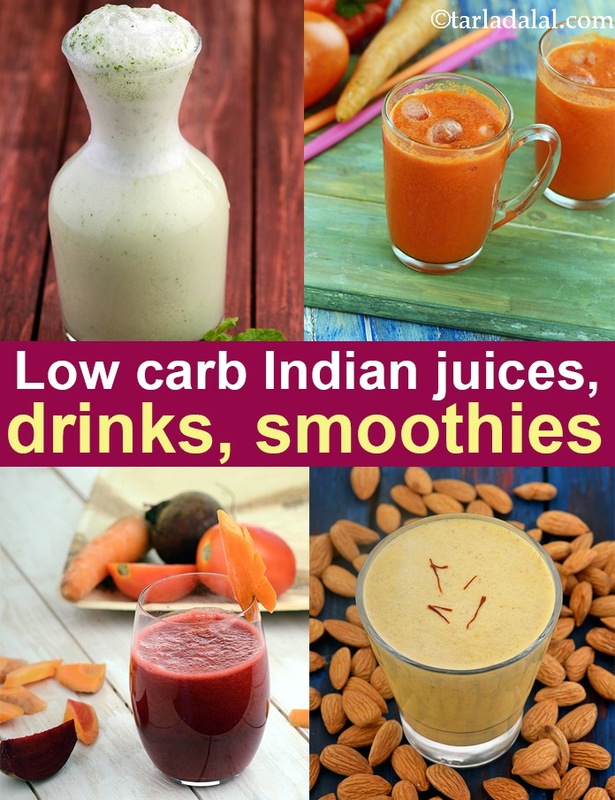 Enjoy our Low Carb Indian Juices, Low carb Indian drinks, smoothie recipes and other low carb recipe articles below.